Ladies and gentlemen, it’s time for you to stay ahead of the Fashion curve! Wondering how? Well, all you need to do is shop from our two new designer ranges! This February, we have two designer arrivals Instore – “Dekho Magar Pyar Se” and “Khoya Khoya Chaand”. 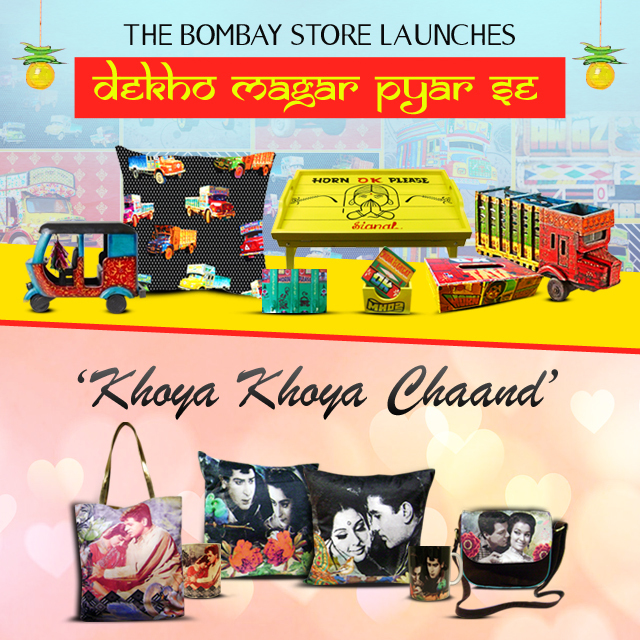 Celebrate “Truck Art” with our quirky range “Dekho Magar Pyar Se”! This collection inspired by the grafitti and messages on trucks on the roads of India, is launched across a variety of product range which include Rectangle Jhola Bags, Coin Pouch, Trays Decoupage, Mugs, Coasters, Cushion Covers, Tissue box and Décor Artefacts. The range “Khoya Khoya Chaand” is just the right pick for all the ‘Bollywood Lovers’. Featuring the Bollywood kings and Queens of Romance from their classic romantic hits, this range is launched across Suede bags, Tote bags, mugs and cushion covers. These designer arrivals are waiting to be handpicked by you at ‘The Bombay Store’ outlets at PM road, High Street Phoenix, Inorbit Vashi, Inorbit Malad – Mumbai; MG Road, Market City Mall, Inorbit Mall – Pune; 1 MG Mall – Bangalore! So, what makes you give this a second thought? Go ahead and visit your nearest outlet now!